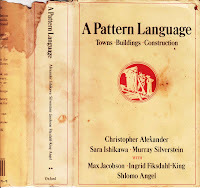 The Whole Earth Catalog called Christopher Alexander’s A Pattern Language “possibly the most important book we’ve ever reviewed.” One of my teachers had studied with Alexander at the University of Oregon, and said that he communed with the gods of space. My favorite pattern is Number 106 (two asterisks), “Give each (space surrounding a building) some degree of enclosure; surround each space with wings of buildings, trees, hedges, fences, arcades, and trellised walks, until it becomes an entity with a positive quality and does not spill out indefinitely around corners.” The idea is that we enjoy a sense of space, but don’t recognize spaces until they’re defined. Barbara made a beautiful little secret garden, with a pond, brick walk, and bench, in the slot between our shed and a corner in the cyclone fence around our lot. Early on, we’d planted bittersweet on the fence, making a hedge. Bittersweet is tough and pretty aggressive, and started popping up everywhere. I dug out the bittersweet, and the garden lost its charm. We’ve replace the bittersweet with less assertive species, but it’s taking time to get the nice sense of space back. Permaculture is a pattern language, although nobody seems to have organized it this way yet. Some of the permaculture principles could be classified as patterns, but they might be a little broad, grammar than vocabulary. Certainly, though, “Obtain a yield by combining species to support each other,” “Arrange your plantations in zones in which those used more frequently or needing more frequent attention are nearest,” and “Trellis fruiting vines on fruit or nut trees” would be included in the vocabulary. Great post! Love that Whole Earth Catalog. Wish I still had a copy.What a great book and what truths.Agree with you about Permaculture.Funny how we do some of these things instintively.Maybe too much thought is our downfall? I don't know that too much thought is our downfall so much as managing it, or knowing when to think and when to trust. It's for sure that I think too much, but at least a little of it must be good for something.